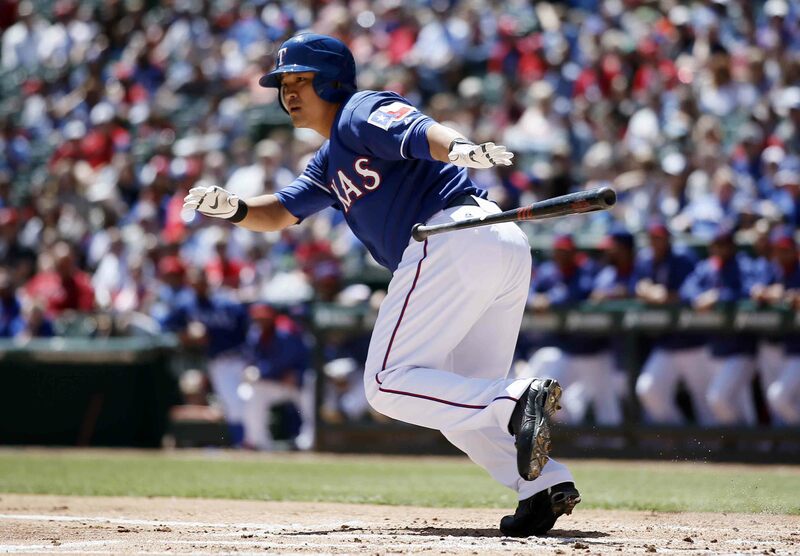 ARLINGTON, Texas (Yonhap) — South Korean outfielder Choo Shin-soo of the Texas Rangers has now hit safely in 14 straight games, the longest such streak in the American League this year. Choo went 3-for-4 against the Kansas City Royals at home, Globe Life Park in Arlington, for his second three-hit game of the week on Thursday. He has recorded at least two hits in each of his past five games. Choo currently leads all major leaguers with 12 extra-base hits — eight doubles and four home runs — in May. Despite Choo’s hot bat, the Rangers lost the game 6-3. Choo is now two shy of matching the longest hitting streak of his career: He had a 16-game run while playing for the Cincinnati Reds in July 2013. Choo batted 10-for-18 in the four-game set against the Royals to raise his average to .243 for the season. He ended April at .096, the worst among all qualified hitters, but has hit safely in every game this month for a robust .373 average. Choo wasted little time extending his hitting streak, getting a leadoff single in the bottom of the first off the right-handed starter Jeremy Guthrie. He had a single in the third and again in the seventh, before drawing a walk in the ninth. Choo reached base four times, but the Rangers failed to drive him home once. After the game, Choo said his hitting streak “meant nothing” to him because the Rangers lost. Looking back on his miserable April, the 32-year-old said he was due for a bounceback.